Here's a healthy variation to fish tacos that is sure to please! As always, it’s important to check the ingredient description on a menu or ask your server. Better yet, follow the recipe below to make your own fish tacos and take away all the worries. These fish tacos have all the flavors of traditional mexican-inspired fish tacos without any of the guilt. 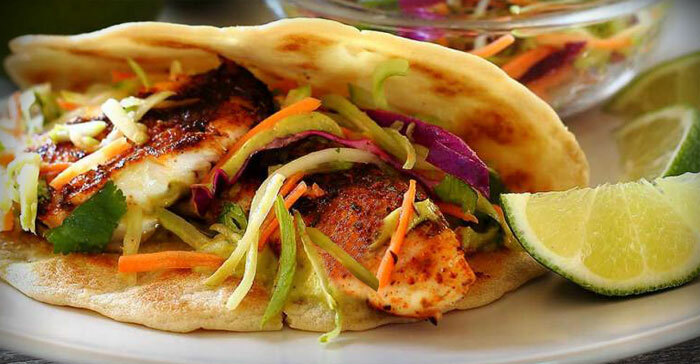 The crunchy slaw covered in the irresistable dressing goes perfectly with the flaky talapia in a low-carb tortilla. 1. Thoroughly mix marinade ingredients. 2. Place uncooked tilapia filets into a large container and gently add the marinade. 3. Seal the container and gently toss to combine and coat the tilapia. Set fish aside for 15 minutes. 5. Add all slaw ingredients to the mixing bowl and stir well to combine with the dressing. Set aside to rest. 6. Heat your grill (or you can pan sear if you don’t have a grill) and cook the marinated filets for approximately 8 minutes. Be sure to cook both sides evenly, with a nice golden brown crust. 6. Arrange your low carb tortillas onto a plate and place filets onto the tortillas. 7. Mix the slaw one more time before dividing evenly onto each of the tilapia filets. 8. Roll up your fish tacos and enjoy! Tilapia is a high-quality, complete protein and contains all the essential amino acids your body requires from your diet to help build proteins. One 3.5-ounce portion of tilapia cooked using dry heat contains about 26 grams of protein. Tilapia is a rich source of omega-3 fatty acids, which are important for growth, development and brain function. According to the U.S. Department of Agriculture, 4 ounces of tilapia contains about 150 milligrams of DHA plus EPA, two important omega-3s. Eating tilapia may help reduce your risk for heart disease. Studies show strong evidence that consuming one to two servings of fish per week, or 250 milligrams of EPA plus DHA each day, significantly reduces your risk for coronary heart disease and sudden cardiac death. Furthermore, eating tilapia on a regular basis may help you control your body weight. Tilapia is naturally low in fat, and only contains about 128 calories in each 3.5-ounce portion.